Lyons Celebrates 99 Years of Girl Scouting with a Big Bash! Happy birthday to you! Is what you could hear loud and clear in Lyons, N.Y. on Saturday, March 12th! Lyons has over 70 registered Girl Scouts and they wanted to throw a party to celebrate the birthday of an organization that they have grown to love and admire. How better to do this than to invite Girl Scouts from surrounding counties and celebrate together. Leaders in Lyons have never planned an event so large. They weren’t sure where to begin, but after months of planning, the 1st S.S.S.S. Convention was born. What does S.S.S.S stand for you ask? Skits, Songs, S’more and Swaps! Invitations were sent out and before they knew it, responses were coming in. Over 100 Girl Scouts from Ganada, Newark, Clyde-Savannah, Macedon, Sodus and Lyons filled the Lyons Community Center for a birthday celebration event. As the celebration begin, the Color Guard, consisting of one girl from each age level in Lyons, quietly walked around the gym and entered the circle of guests sitting in the middle. As a group of Sister Girl Scouts they said the pledge of allegiance and the Girl Scout promise. Once done, the color guard was dismissed and the party started! Each troop was asked to perform either a skit (short-play), sing a Girl Scouting song or tell a scouting story. Many troop dazzled the guests with a favorite song others performed skits that represented treasured songs like Princess Pat, Hermy the Worm and Bug Juice. After the last troop performed, the girls all sang Happy Birthday with the help of Lyons own rising star Amber Stowell. 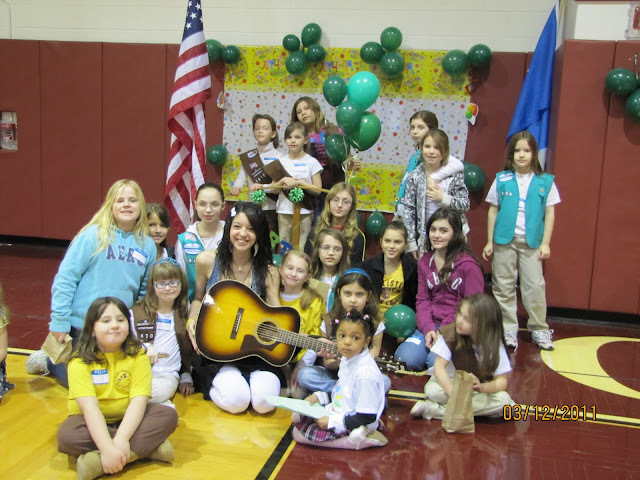 Amber entertained throughout the event by performing some Girl Scout favorites along with some of her own music. Check out Amber’s CD. It is available at Dobbin’s Drugs in Lyons. S’more and Social time came next. Lyons Girl Scouts provided delicious S’more themed snacks for their guests. S’more brownies, S’more cookies, S’more bird nests and marshmallows coated in chocolate and dipped in graham crackers were just a few of the many wonderful selections the girls had to choose from. During this time the girls posed for photos in the birthday corner and made new friends along the way. Swaps came next. What are Swaps? It stand for, special Whatchamacallits affectionately pinned somewhere. Each troop prior to the convention was given an estimated head count to ensure each girl received 1 from each troop. Tables were set up for each troop to display their swaps and the girls walked from table to table to collect a little treasure from each. Finally as the 1st S.S.S.S. Convention came to a close, all the girls and leaders formed a large friendship circle, took each other hand and performed a friendship squeeze. They said their goodbyes in farewells in hopes of a bigger and better birthday bash in 2012 as Girl Scouts celebrates 100 years of scouting. For more information on Girl Scouting you can contact NYPenn Pathways at 1-800-448-6954. 0 Comments to "Lyons Celebrates 99 Years of Girl Scouting with a Big Bash!"